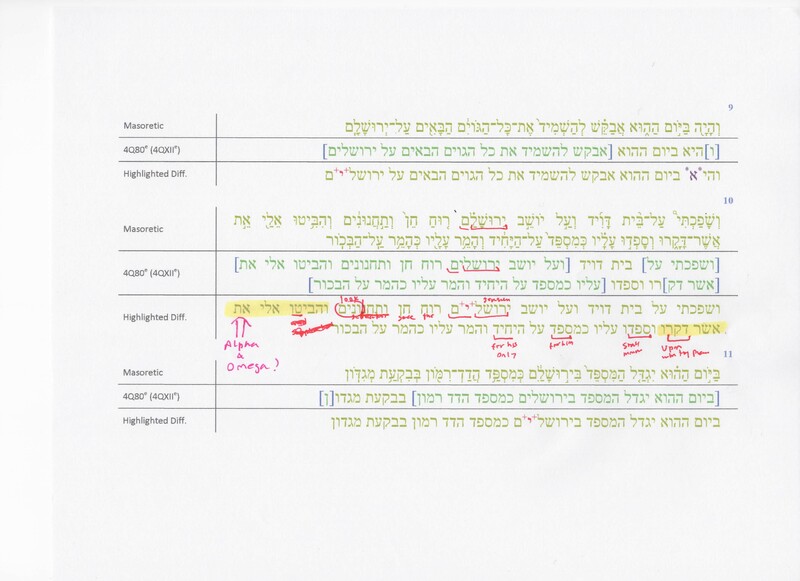 How can we understand differences between the NWT and Latin/Hebrew/Greek on Zechariah 12:10? Is there any early manuscript that shows a word translatable as "the one" (3rd person) in Zechariah 12:10? I understand that, assuming Jehovah God—the one speaking, cannot be the one being pierced.1 Therefore some of the later Hebrew manuscripts read “look upon him whom they have pierced”, rather than “look upon me whom they have pierced”, some even claiming that they were 'corrected' and eventually in some manuscripts changed (Although, as quoted by a JW source "the oldest and best Hebrew manuscripts read “me” rather than “him”). According to this response on another SE, what started from a correction, on the assumption of something that didn't seem right, may have repeated down in history down to a "cannot" conclusion. Is there any early credible manuscript/source that shows a word translatable as "the one whom"? Based on what I can see and my limited knowledge of the ancient languages shown above, there isn't. I appreciate your help in providing sources that support your answer. 1 A possible Christian interpretation could be that He is speaking of Jesus being pierced on His behalf. Zecharaiah 12:10 is discussed in depth in the Fourth Gospel and the Scriptures: Illuminating the Form and Meaning of Scriptural Citation in John 19:37 by Wm. Randolph Bynum, Published by Brill in Supplements to Novum Testamentum 144 Publication date June 2012. The portion of the verse we are looking at is וְהִבִּיטוּ אֵלַי אֵת אֲשֶׁר־דָּקָרוּ in the MT. In Chapter 5 text critical issues are addressed and Bynum writes that אֵלַי could be vocalized differently as ' אֱלַי "to whom" a variant vocalisation in construct form based on the identical consonantal MT'. As far as I can tell this would be the way the Evangelist understood the verse when he wrote in John 19:37. και παλιν ετερα γραφη λεγει "οψονται εις ον εξεκεντησαν." and again another scripture says "They shall look to whom they pierced." This is perhaps influenced by proto/Theodotian, (I don't have Gottingen so I'll quote from Field) και επιβλεψονται προς με εις ον εξεκεντησαν και κοψονται αυτον. It would not surprise me if the double translation of אלי as "προς με" and "εις ον" is due to a conflation of LXX and p/Theodotian readings. This is likely also the influence in the NWT, as εις could be read as both a numeral and a preposition. You are correct. There is no known early credible manuscript/source that shows a word translatable as "the one whom". Below I have quoted an old Watchtower article that explains Zechariah 12:10. Zechariah 12:10 states: “They shall look upon me whom they have pierced, and they shall mourn for him, as one mourneth for his only son, and shall be in bitterness for him, as one that is in bitterness for his firstborn.” Jehovah is the speaker, and it sounds as though he was the one pierced instead of Jesus. Some argue this proves that Jehovah and Jesus are one in a trinity. So how is Zechariah 12:10 to be explained?—R. B., New York. To avoid what seems to be a piercing of Jehovah some of the later Hebrew manuscripts read “look upon him whom they have pierced”, rather than “look upon me whom they have pierced”. At first these late Jewish manuscripts show this in the Keri, or corrected reading in the margin; but eventually in some manuscripts the change was brought up into the body of the text itself. Rotherham’s translation, on the basis of these late manuscripts, offers in a footnote “him” as an acceptable reading in place of “me”. So does the American Standard Version. Some modern translations, such as Moffatt and An American Translation and Revised Standard Version, use “him” instead of “me” in the main body of the text itself. However, the oldest and best Hebrew manuscripts read “me” rather than “him”. Not the answer you're looking for? Browse other questions tagged textual-criticism zechariah new-world-translation or ask your own question. In Zechariah 12:10 what is the effect of אֵת (in conjunction with “to me”)? How can we understand differences between NWT and Latin/Greek on Acts 20:28? Which Greek NT passage has proven to have the most variant readings? In Zechariah 12:10-14, why do the men and women mourn separately? Who are the persons from Zechariah 12:10? How does Revelation 1:7 compare to Matthew 24:30? Does the Codex Sinaiticus contain the Hebrew Tetragrammaton or Greek LORD (KURIOS)?